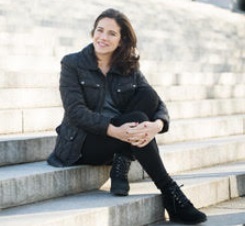 Lisa D’Apolito is a documentary and branded content director. Lisa started out as an actress in film, theater and television including a part in Goodfellas. She went on to producing and directing, making her way to SVP/EP of Production for FCB, an advertising agency and then to starting her own branded content production company 3 Faces films. Her short narrative film, “The Gynotician” starring Amber Tamblyn & David Cross won several festival awards. Her feature documentary “Love, Gilda” was selected as the opening night film of the 2018 Tribeca Film Festival. Lisa was named one of Variety Magazine’s 10 Documentarians to Watch in 2018. I have a great collection of friends that I have a met though out my life. I think I am a good friend. I try to be supportive of others. I think or I hope I have integrity and honesty. A living space with a balcony overlooking the beach. To continue to make films I believe and I enjoy making. To travel all the parts of the world on my list. My son and career wise Love Gilda. Making a film about Gilda Radner and getting to know her has been is such a great gift. When both my parents and grandmother were ill at the same time and all passed away when I was pregnant. It's Always Something- Gilda Radner.. It really is true! Gilda! I love the classic great actresses. Katherine Hepburn, Bette Davis, Audrey Hepburn, Vivian Leigh. The beach!!! Also, exotic places that I have always imagined what they would be like and when I got there they were even more special. Beautiful fabrics, make up and animals. Love, Gilda has taken me to so places I have never been. Presently my passion is traveling with the film and deciding on my next subject for a film that I will want to spend the next few years with. My personal fun it is shopping in consignment shops where I travel.